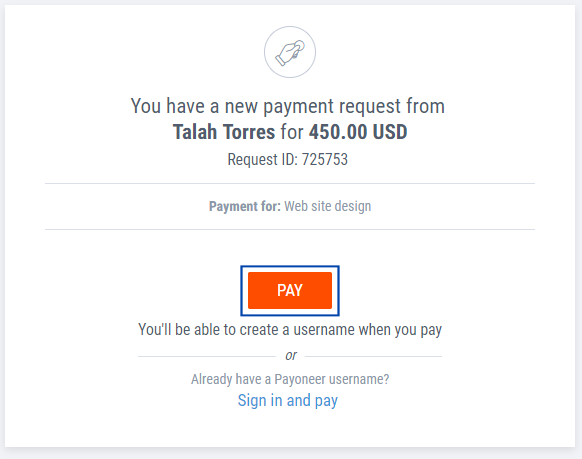 Do you regularly receive payment requests from freelancers, contractors and other service providers? Paying and tracking those payment requests just got easier! 1. 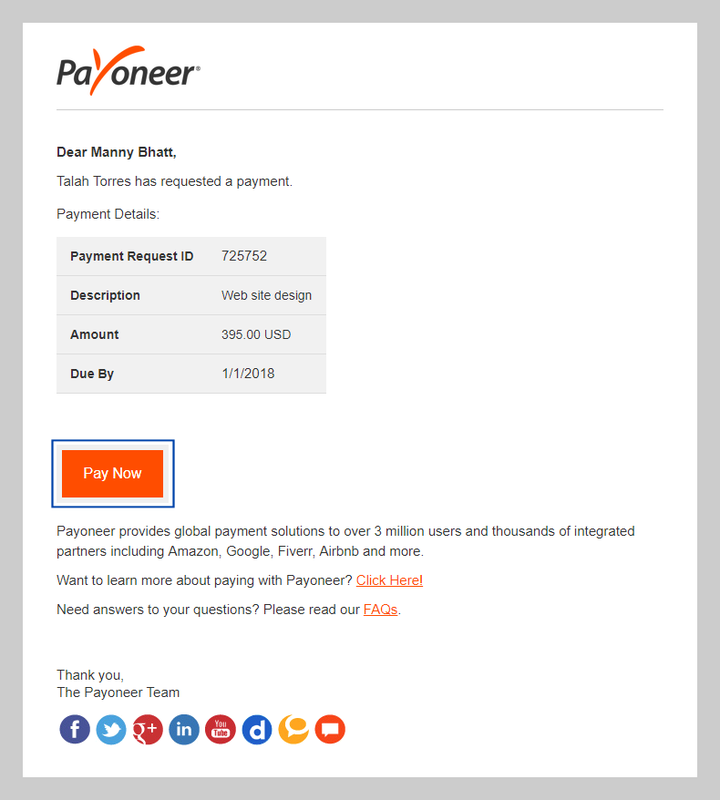 Click Pay Now in a payment request email to access the Payoneer Online Payments application. 2. Select SIGN IN AND PAY, and sign in. 3. Complete the payment request steps. 4. 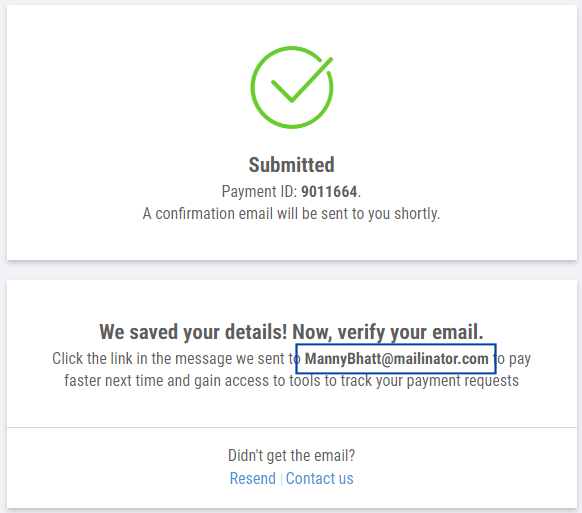 On the payment confirmation page, note the email address to which we sent you a verification email. This is required to verify your identity and keep your details secure. 5. Open the verification email and click VERIFY MY EMAIL. Once your email address is successfully verified, continue to the Payment Requests Received page. 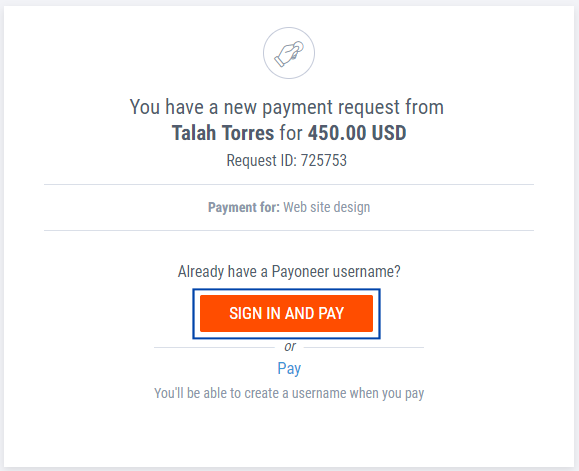 If requested, sign in using your Payoneer credentials. 3. Review and update contact details as you usually would. 4. At the bottom of the form, create a password. 5. Ensure your details are accurate, then click NEXT. 6. Complete the remaining payment steps. 7. 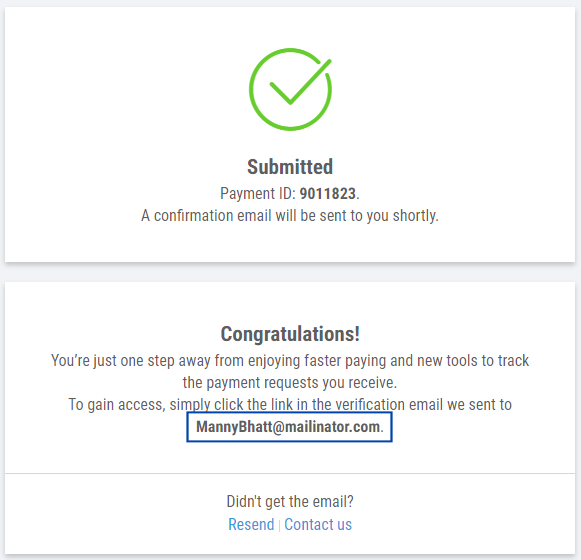 On the payment confirmation page, note the email address to which we sent you a verification email. This is required to verify your identity and keep your details secure. 8. Open the verification email and click VERIFY MY EMAIL. Once your email address is successfully verified, continue to the sign-in page. 9. 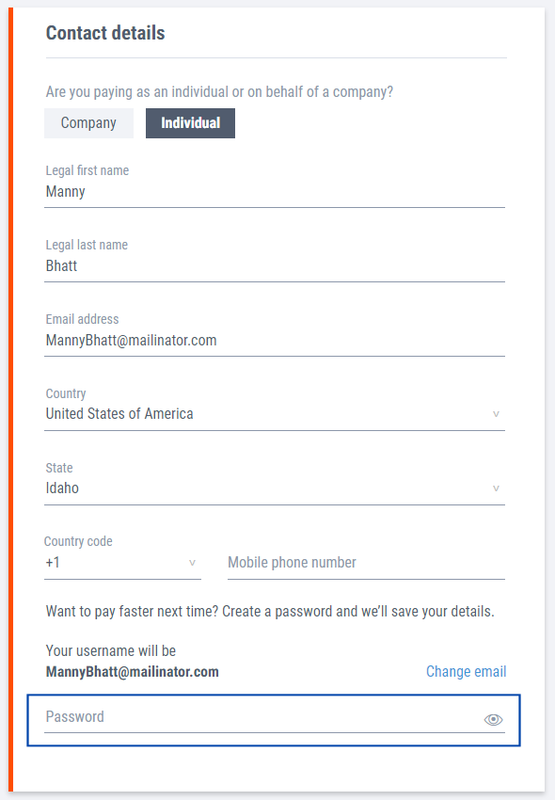 Sign in using your email address and the password you created. 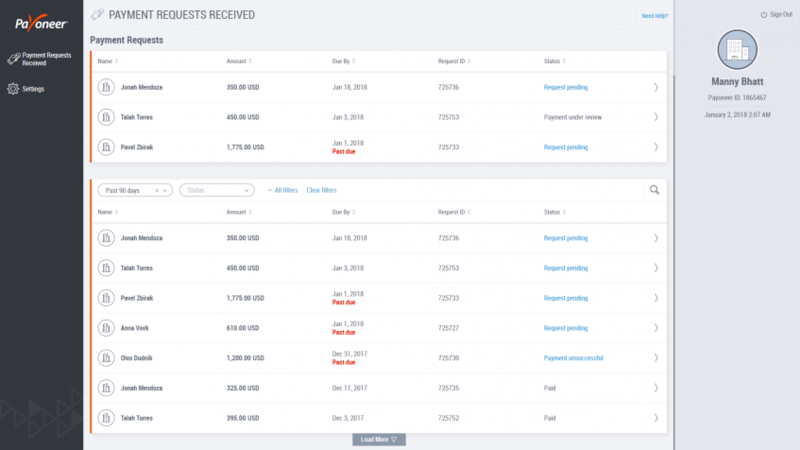 You will now see the Payment Requests Received page. 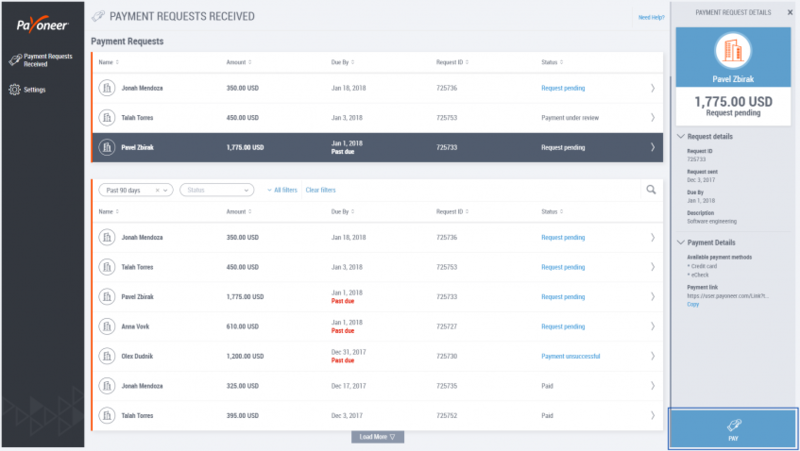 In the main table, view all of the payment requests you have received. Payment request statuses are updated in real time. 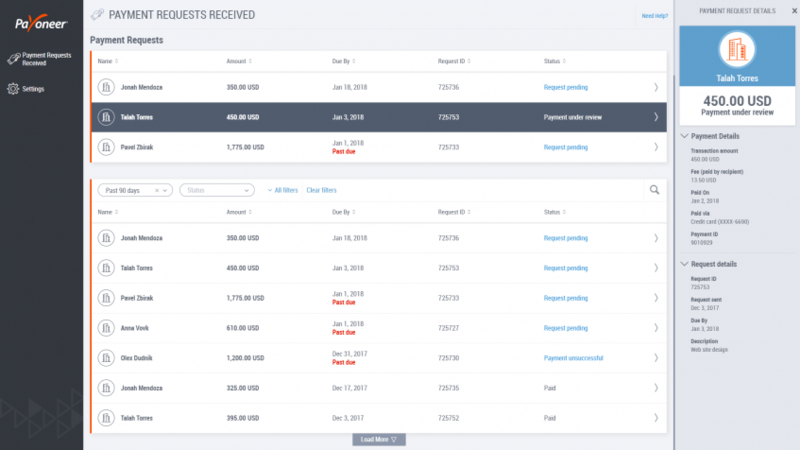 If you have unpaid payment requests, you can quickly see the three most recently received requests in a separate table at the top of the page. Select any request to see its details in the right pane. Pay any pending payment request by selecting it and clicking Pay in the right pane. Filter by Past due? > Yes to see all unpaid payment requests whose payment due date has passed. Filter by Status > Paid to see all payment requests that have been paid in full. Search for a specific request by receiver name or request ID. View all the payment methods you have used to make payments. 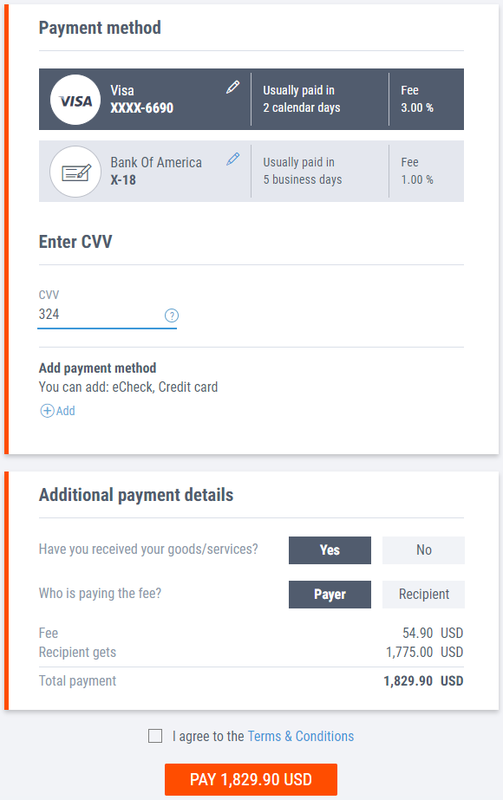 Click Settings in the left menu, then Payment Methods. 3a. Click a payment request whose status is Request pending. 3b. 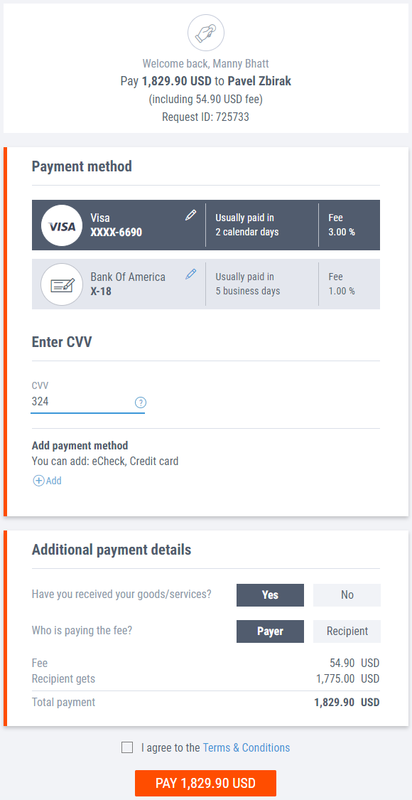 Review the details in the right pane and click PAY at the bottom. 3. 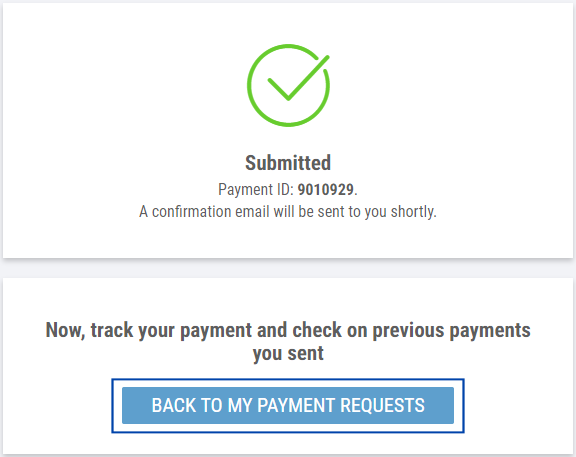 After paying, click the BACK TO MY PAYMENT REQUESTS button to quickly return to the table of payment requests received, where you can pay additional requests. Sign in regularly to check the status of your payment requests and pay any new payment requests you receive. Bookmark the URL https://login.payoneer.com. You can also pay quickly from payment request emails – just remember to sign in for fast paying. Learn more about how to quickly and easily pay your overseas service providers!